Will this cloud-connected phone do enough to win us over? Despite being a known name, Acer is still a relatively small player in the smartphone market. It keeps dipping its toes in but its output is dwarfed by the likes of Samsung and HTC, and it is yet to find much success. Its latest foray is the Acer CloudMobile S500, and rather than relying purely on specs, Acer is hoping the handset will stand out thanks to its cloud storage options. Cloud storage is such a big feature of the phone that it has even put it in the name. Making use of the AcerCloud service, it enables you to upload documents, photos, music and videos and share them between the Acer CloudMobile S500, your PC and any other Android phones or tablets you might happen to have. It's increasingly hard for smartphones to stand out purely based on their specs, so a unique selling point like this is definitely a good approach. Priced at around £290 (around AU$450/US$466) SIM-free, the Acer CloudMobile S500 is sitting pretty close to the top of the pack in terms of price. It's a fair bit cheaper than an iPhone 5 or a Samsung Galaxy S3, but it's around the same price as the still-pretty-powerful Samsung Galaxy Nexus or HTC One S.
It's fortunate then that Acer isn't relying on its cloud service alone to tempt people to part with their hard-earned cash. Sure it's the headline feature, but even ignoring its cloud credentials this is a decent handset with solid - though not world-beating -specs. With a 4.3-inch 1280 x 720 display, a 1.5GHz dual-core processor, 1GB of RAM, an 8 megapixel primary camera and 1080p video recording, the Acer CloudMobile S500 certainly ticks a lot of boxes on the spec sheet, easily matching similarly priced handsets. It also has a front-facing VGA camera and comes with Android 4.0 Ice Cream Sandwich out of the box. If only it had come with Android 4.1 Jellybean it would be that much more compelling, but Ice Cream Sandwich is still a great and relatively up-to-date operating system. Rounding out the package, there's a slightly disappointing 8GB of internal storage included. 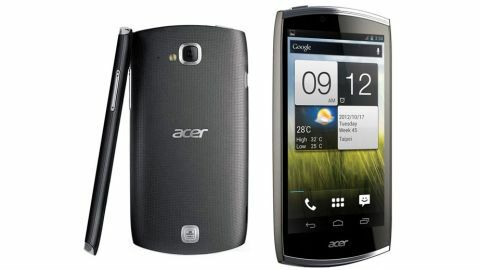 But unlike the Samsung Galaxy Nexus, the Sony Xperia S and the HTC One S, which make up three of its closest competitors; the Acer CloudMobile S500 comes with a microSD card slot for cards of up to 32GB. At first sight, the Acer CloudMobile S500 doesn't exactly set hearts on fire. It's undoubtedly a premium handset, but it looks smart rather than stylish. For the most part it's black and grey, and the end result is very plain. A silver trim and curved edges class it up considerably, but it could still never be accused of being stylish or cool. It wouldn't look out of place in a conference room, and that's probably no accident. The AcerCloud service seems to be primarily aimed at business users, enabling them to access their work remotely and easily sync it and back it up. Once you pick it up, impressions improve considerably. The mottled back cover provides a reassuring amount of grip, while its curves ensure it fits snugly in your palm. With dimensions of 127 x 65.8 x 9.9mm (5 x 2.6 x 0.4 inches), it's a fairly dinky phone considering it's rocking a 4.3-inch screen. That's probably down to the complete absence of any buttons on the front of the handset. There's very little wasted space, and other than the front camera lens and the word 'Acer' stamped across the bottom, it's almost all screen. The only other thing on the front is the speaker, which is hidden in the decorative silver bar at the top. On the other hand it's not the thinnest phone around, coming in at more than 2 inches thicker than the iPhone 5, but it doesn't feel chunky. Turn the phone over and you'll find the main camera lens near the top and a hands-free speaker near the bottom, with the 'Acer' logo printed in silver across the middle. On the left side there's a micro USB port for charging it or connecting the handset to a PC, while on the right there's a volume rocker. At the top there's a 3.5mm headphone port and the power button. Finally at the bottom there's a microphone that's visibly nothing more than a little dot. You might have noticed that we've neglected to mention any sort of physical home button, and that's because there isn't one. As we noted above, the front of the handset is button-free, and it's a great look, keeping it as sleek as possible. While the lack of a physical home button can be a bit jarring at first, you quickly get used to it, and it's likely to be a design decision made by more and more handsets going forward, since recent Android builds don't require one. A little indent in the back cover enables you to pull it straight off, and while it's quite flimsy it's certainly more substantial than some that we've come across. Underneath you'll find the 1460mAh battery, a micro SIM slot and a microSD card slot. We were happy to find that the microSD card slot is accessible without removing the battery, meaning that cards can be swapped more easily. Because there is a relatively small amount of internal storage, this becomes even more appreciated.